Lucknow University Admit Card 2019 will be available for the students from 20th April 2019 onwards. Applicants can download the admit card from the website of the Lucknow University. In this post, we have compiled all the information about the admit card of Lucknow University for UG PG courses. The Lucknow University offers the Under Graduate and Post Graduate courses in various fields including Technology and Management. To get the admission in UG courses offered by the Lucknow University the applicants will have to take the entrance test conducted by the University. Admission in PG courses is offered on the basis of merit list. To take admission in professional PG courses the applicants will have to go through the entrance exam conducted by the university. To appear on both types of entrance examination the applicants would need their Lucknow University Admit Card 2019. Read this article further to know the overall information about Lucknow University hall ticket 2019 such as releasing date of admit card, important instructions and admit card and downloading process. Lucknow University will release the admit card for its various entrance exams online. Candidates can get their admit card from the website of Lucknow University bu entering their Registration Id and Password in the portal. Admit card is an important document for the applicants so they need to be very careful about it. it is suggested to the applicants to keep their details such as registration id and password handy so they could download their admit card easily. The university has decided to make the admit card available online so all the students can get on time. Applicants will not get the Lucknow University admit card by post at their communication address, they will have to download it from the website. As we stated above the university conducts different entrance tests to offer admission in different UG and OG programmes so the admit card release date will also be different for each course. Get the information about the release date from here. To appear in the exam of Lucknow University conducted to offer admission in many courses in Under Graduate and Post Graduate the applicants would need their admit card. To get the Lucknow University Admit card 2019, you will have to follow the below given steps. Step 1: Visit the official website of Lucknow University. The link of the website has been given on this page. Step 2: Look at the Admit card link and click on it. Step 3: your click will take you to another page of the website. Type your registration id and password in the given boxes. You will also have to type the captcha code in the box is given on the page. Step 4: after entering all the details click on generate Admit card button. Step 5: Now your admit card will appear on your screen. Take its print out and save its soft copy too. As you know that you will not be allowed to take the exam of Lucknow University in absence of admit card but if any of your information will be wrong in you admit card then also you will have to face problems. So it is suggested to read your Lucknow university admit card carefully. Applicants need to note this that their LU Admit card for UG and PG courses is not only important for the exam but at the time of counseling also you would need it. So it is suggested to the applicants to keep it safe with you. 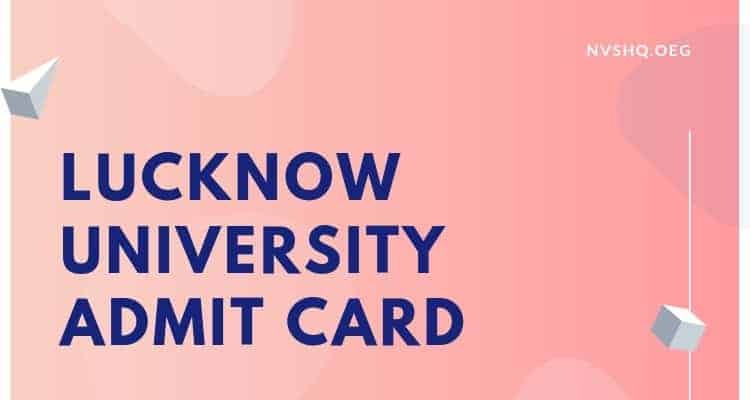 We have mentioned all the information related to Lucknow University Admit Card 2019 in this article. if you have any question related to Lucknow University 2019 exam then ask us through the comment box below.